It will not be a happy Independence Day for shopkeepers displaced by the Metro. The BMRCL has planned shop-less stations in key areas like Indiranagar, drowning the question of compensatory space for them. This thriving local economy in Rajajinagar is in for a shakeup with the Metro station coming there. Traders are unhappy with the deal they are getting. Is the land acquisition law absolute? Experiences from cities across the world shows us what can happen when governments take away private properties in the name of public purpose. On March 28, Chief Justice Cyriac Joseph admitted a PIL against the Metro on grounds of absence of a comprehensive legislation for its implementation. The CMH Road traders’ association filed the PIL. While more footpaths need to be developed around Metro stations, the real estate madness needs to be reduced. A higher Floor Area Ratio of 4.0 is being proposed for properties within 150 meters of all stations. 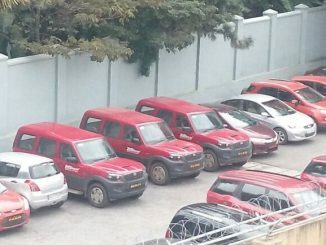 The Metro is Namma, but what about its parking lot? A commuter who wants to park her car in Metro station finds private ‘for hire’ vehicles parked there. Have you too faced this situation?